The pattern is from Kim Hargreaves' book North and is called North. I loved the book in its entirety when it was first published but North wasn't among the patterns that I wanted to make one day. For several reasons. It seemed too complicated (turned out to be true), too warm, and too expensive (10-11 balls of Rowan Kid Classic plus 11-12 balls of Rowan Kidsilk Haze). It looks modern and sporty on the model though, and these pockets! I love pockets because my hands are always cold. Yet, the cables - every four stitches cabled in every fourth row - are the most tedious cables on the planet. How to make a whole jacket in a pattern that requires long hours of boredom? You need a special motivation for this that I definitely didn't have at the moment. During our last visit to England almost accidentally (as I described here) I acquired a lot of yarn. When at home I looked at 15 balls of Rowan Hemp Tweed in a pretty color of asphalt and instantly knew that they were meant to become a big, comfy, cabled jacket with a zipper and pockets. I myself don't need a jacket like this but one of my daughters definitely does. And it would be a great Christmas present. After all, fall is for making presents and I was a little bit behind already. Again, North wasn't my first choice for this jacket but when I looked at the yarn requirements it was clear that it was a contender. I already had an unusually big amount of yarn and this jacket would look great in dark grey tweed. After Colonel cardigan I stopped being afraid of zippers. Sure, they take a lot of time and you have to be very focused while sewing them in, but if you make a mistake (or two, or three...) you can always undo and start over. The only thing - you've got to have time and patience. Same thing with tedious patterns - they need time and patience. I made a swatch - it was an almost perfect match. Same gauge as in the pattern (my row gauge was different: 22 rows in 4") - a sign, right? While cleaning my house, I found a zipper I totally forgot about and it was black and the exact length required for the pattern - another sign, right? So, my choice was made, the dice were cast. Now I had to invent something to trick myself into making this difficult jacket. After some deliberations, I figured that the most difficult part that probably would take the longest is the back. What if I start with the fronts instead? 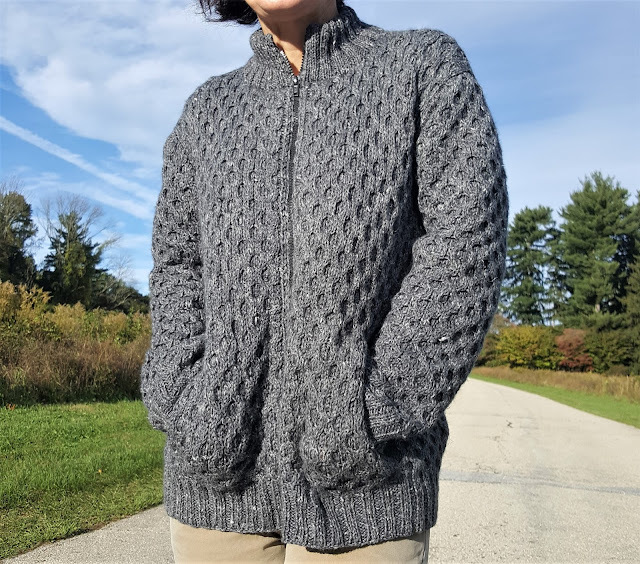 Fronts need pockets and opening edges which make them more complicated but at the same time more interesting to knit because there is always something happening and you need to pay attention. Plus, if you have already two fronts done it is too late to chicken out and you have no other choice but to finish the project. This is how my North got started - with the left front. I was instantly pleasantly surprised at how well the pattern was written. Yes, I must admit, North is absolutely brilliantly thought through and calculated. My only problem was when I got to the point after the armhole when the pattern says: "Cont straight until 11 rows less have been worked than on back to start of shoulder shaping". Since I haven't made the back yet, how could I know when to stop? No problem. Let's do some math. The armhole measures 19 cm from start to shoulder shaping. The gauge is 22 rows in 10 cm. How many rows for the armhole? X(armhole rows) = (22 x 19) : 10 = 41.8. 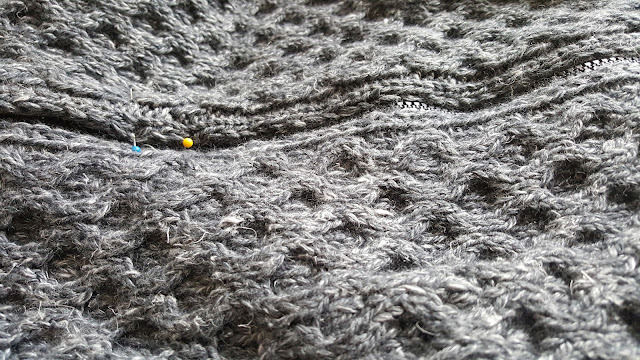 Approximately 42 rows for the armhole from start to shoulder shaping. 42 rows - 11 rows = 31 rows for the front armhole to neck shaping. Easy-peasy! And this is how both fronts were finished rather quickly. While they were drying I started the back. Yes, it was hard to make - cabling 138 sts in every 4th row is not a walk in a park. But... I already knew how many rows I had to make (20 - for ribbing, 86 - till armhole, 42 - after armhole). I don't know about you, but when I know the amount of rows, work seems to be easier. I can pace myself, calculate how fast it could be done if I make that many rows per day etc. While the front parts were drying, I started alternating working on the back and inserting zipper in the front. Both tasks were strenuous, but at least they were different kind of strenuous. To tell you the truth, I got really tired of this jacket and its pattern at some point. And was ready to quit. Fortunately, it happened when I was making sleeves. I made them as long as the pattern required but spaced the increases more evenly (more details on my Ravelry page). After the sleeves were done and were drying I put together the fronts (with zipper sewn-in) and back and made the collar. Again, didn't change anything, followed the pattern that asks you to fold it in half and hide the remaining part of the zipper in the seams. Cool, but took quite a lot of time. Before I forget, 15 balls of Hemp Tweed were not enough to finish this jacket - imagine that! I ordered two more balls but needed only half of a ball for the collar. A couple of words about this yarn. There was a knot (or two) in every ball. And they are only 104 yards long. Not good! 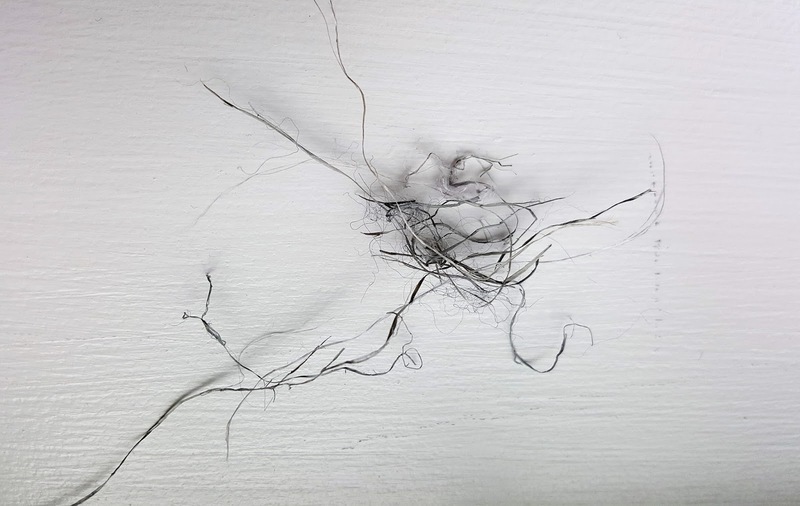 Plus I got distracted by some strange twig-like strings that I kept pulling out of my thread (couldn't help myself). Somehow it didn't look right to leave them intact even though it might be an important "hemp" part, who knows? It was easy to work with, yet, a little splitty when cabling without cable needle. A lot of last Rowan patterns are made from this yarn so I was expecting it to be a winner. Cannot tell you that it won me over. The jury is still out on this one. Finally, the jacket was finished. I put it on and the fit was perfect. Even with long sleeves. 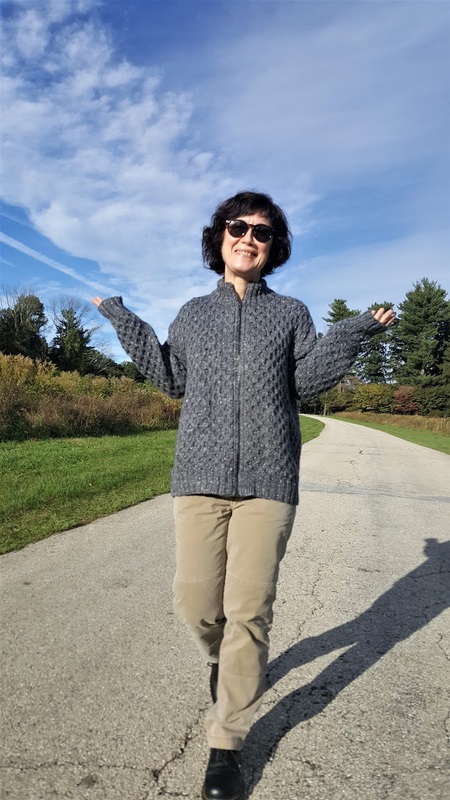 I made size M because it is an outdoor garment and is supposed to be worn over other clothes. Still it fits me well. So if you decide to make it one day, be careful with the size, measure everything first. It was a challenge for me to finish this one and I like it too much to give it away. Yes, most likely I'll keep it - a reminder of my battle with myself. P.S. About your comments on this blog. They don't appear immediately. I have to approve and publish each one of them to avoid spam. So don't worry if you commented but cannot see it on the blog - it will be there eventually. Just give me some time! Any suggestions on how to speed this process are highly appreciated.